John Chervinsky is fascinated by the scientific principles that govern our existence – in this case the concept of time. 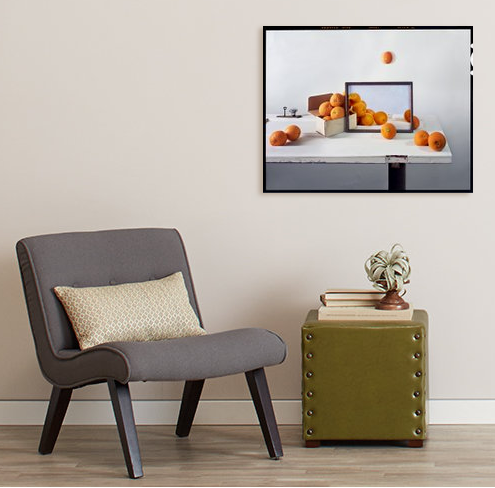 Oranges, Box and Painting on Door is from the series Studio Physics in which Chervinsky sets up his still life, photographs it, and crops a subset image which is then sent to a painting factory in China and painted by an anonymous artist. 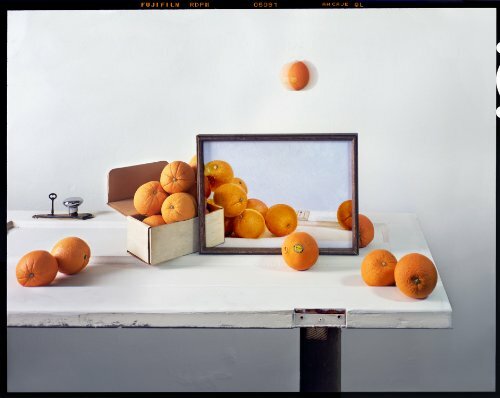 The painting is mailed back to the Chervinsky, who reinserts it into the original still life and re-photographs it. The final image shows the painting and the still life which has remained untouched during this experiment and documents the marking of time. Next available edition number is 12/15 International shipping available upon request. Please contact the gallery for rate quote.